Will their lyrics finger our faults? A place where we were born. For us to fight with ourselves any longer. Soweto is now an amusement park for tourists. Trying to get that cheese. And made everything seem good. Is a fact that lives to haunt economists. That shout, ‘Free education for all’. It’s outstanding wish to co intact you face to face. Make it happen. Maakomele Manaka , was born in Diepkloof zone 6, Soweto in 1983. The first of two boys born to artistic parents. Mak, as he is widely known is the son of the late Matsemela Manaka a well known visual artist, poet, play write and black consciousness activist . His mother, Nomsa Kupi Manaka is a pioneer of African dance, an established dancer,choreographer, and actress in South Africa. With a natural artistic gift as a poet and writer and a strong artistic heritage , Mak was destined to be an artist. South African icon Don Mattera says, “If genius can be genetically connected and if it flows from generation to generation, then Mak Manaka is the epitome of it. He comes from a dynasty of talented, creative and gifted people Nomsa and Matsemela”. At the age of 5, he received a Young Artist Award at the once famous Funda Arts Center in Soweto . He started writing poetry at 14 yrs old , just two years after his near fatal accident which left him in a wheelchair for a year and a half. He started performing at the age of 15 on crutches, debuting in 1998 in Lugano, Switzerland at a tribute for his late father. In 1999, he performed at the Windybrow Arts Theater with British poet Benjamin Zephaniah and South African poet Dr Don Mattera. In 2000 he performed for Arnold Shwaznager on his visit to South Africa at the Takalani Home for the mentally Handicapped school. In 2001, he performed at Horror Café in a show called Urban Voices with Grammy award winning American poets Sarah Jones and Steve Coleman along with other young and aspiring South African poets. This was to become a milestone poetic performance for Mak – as it formerly introduced him as an integral part of the local spoken word scene . In 2002 he performed for the former president of South Africa Mr. Thabo Mbeki at the SABC in a live program called In conversation with the President hosted by Tim Modise and during that year he compiled all his works for publication of a poetry book, If Only. During the subsequent years he become a sought after poet as well as headliner for various festivals and events including the annual international Urban Voices Poetry Festival which took place nationally in SA. Over the years on various Urban Voices stages he has performed with international and locally acclaimed poets including the likes of Mutabaruka, Linton Kwesi Johnson, Saul Williams, the Last Poets, Ursula Rucker, Lesego Rampolokeng , Keorapetse Kgositsile and various other poetic icons.He was commissioned to perform for the former president of South Africa, Nelson Mandela at the launch of a primary school in Soweto. Later that year, Mak toured Cuba and Jamaica with poets Don Mattera and Lebo Mashile representing South Africa in celebrating 10 years of democracy. . In the 2004 he was nominated for The Daimler Chrysler Poet of the Year 2005 Award. This year also saw Mak Performing in Holland, at the Crossing Borders Festival. In February 2005 he spent a month in Germany on an island called Sylt and performed in Hamburg and Berlin. Later that year he played a character also called Mak and who was facing disability issues in the children’s television program Soul Buddies on SABC. In 2009 Manaka launched his second anthology In Time, in Italy at a Literature festival in Mantova. The anthology sold out months after its release. In 2011 He performed at the MNET awards, the Television awards for Good (TAG). In 2012, Mak performed in Padova, Italy at the Porsche Live Festival. In June 2012, Mak represented South Africa at the 18th Genoa International Poetry Festival in Italy. In the same month he performed at the Listros Gallery in Berlin, Manaka also facilitated workshops at the prestigious Humboldt University called Poetry 101 with Mak Manaka. He also performed at The Moving Poets in Berlin with an installation of a Berlin based South African visual artist, Liz Crowley. 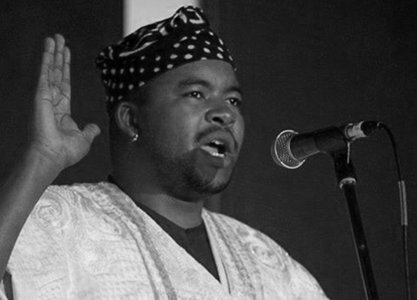 He also performed at Badilisha Poetry X-change’s 100 Thousand Poets for Change.